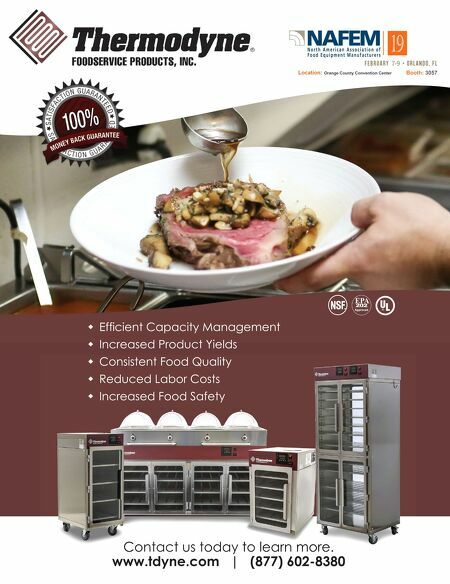 70 • FOODSERVICE EQUIPMENT & SUPPLIES • FEBRUARY 2019 late in the process still creates head- aches. "Within the design and construc- tion industry, there is the perception that, since everything is done electroni- cally, things are easy to change," says Landgraf. "However, changes late in the process impact several trades, like architecture, interior design, electrical, plumbing and so forth. This takes time to coordinate among several parties." BIM isn't foolproof, Schultz says. "Soft- ware doesn't drive it — people drive it." Still, many architects require BIM as a standard, says Landgraf, who views it as a competitive tool to stay on the forefront of design. Ingraham agrees: "We are con- sistently looking for opportunities to provide more detail to our models, provide tools for clients to review models on their own, and to bring this technology into the construction process." BIM makes talking through the project a whole lot nicer, Schultz says. "Clients can actually see how we're moving through [the process]. What may be causing an issue? Why did we do what we did?" He adds that ulti- mately, it provides a better understand- ing of design intent. It's a tool Ricca Design Studios uses for all areas. "We utilize 3-D design for all spaces, from front of the house to back of the house, even loading docks," Ingraham says. "This allows the entire operations team to review exactly how guests circu- late through a space, where the chef will stand and what's within reach, what man- agers can see from their offices or how high a wall shelf is hung. Understanding the diner and employee experience is just as important as the ergonomics and operation of a dish room." And front-of-the-house BIM mod- eling can often be more complicated than designing the back of the house, according to Cory. "When you are deal- ing with back of house, it's more utili- tarian. They are pretty much modeled the same way." In the front areas, the architect may add aesthetic touches to enhance the customer experience. "It gets more complicated when you add aesthetics into the modeling," he says. 3-D modeling continues to trans- form the foodservice design experience. It increases the designer's ability to get it right early on in the process. BIM software can build clients' ideas into a design that, through 3-D modeling, will actualize their expectations. FE&S ALTERS THE DESIGN ALTERS THE DESIGN ALTERS THE DESIGN ALTERS THE DESIGN ALTERS THE DESIGN ALTERS THE DESIGN ALTERS THE DESIGN ALTERS THE DESIGN ALTERS THE DESIGN ALTERS THE DESIGN ALTERS THE DESIGN ALTERS THE DESIGN ALTERS THE DESIGN ALTERS THE DESIGN ALTERS THE DESIGN ALTERS THE DESIGN ALTERS THE DESIGN ALTERS THE DESIGN ALTERS THE DESIGN ALTERS THE DESIGN ALTERS THE DESIGN ALTERS THE DESIGN ALTERS THE DESIGN ALTERS THE DESIGN ALTERS THE DESIGN ALTERS THE DESIGN ALTERS THE DESIGN ALTERS THE DESIGN ALTERS THE DESIGN ALTERS THE DESIGN ALTERS THE DESIGN ALTERS THE DESIGN ALTERS THE DESIGN ALTERS THE DESIGN ALTERS THE DESIGN ALTERS THE DESIGN ALTERS THE DESIGN ALTERS THE DESIGN ALTERS THE DESIGN ALTERS THE DESIGN ALTERS THE DESIGN ALTERS THE DESIGN ALTERS THE DESIGN ALTERS THE DESIGN ALTERS THE DESIGN ALTERS THE DESIGN ALTERS THE DESIGN ALTERS THE DESIGN ALTERS THE DESIGN ALTERS THE DESIGN ALTERS THE DESIGN ALTERS THE DESIGN ALTERS THE DESIGN ALTERS THE DESIGN ALTERS THE DESIGN ALTERS THE DESIGN ALTERS THE DESIGN ALTERS THE DESIGN ALTERS THE DESIGN ALTERS THE DESIGN ALTERS THE DESIGN ALTERS THE DESIGN ALTERS THE DESIGN ALTERS THE DESIGN ALTERS THE DESIGN ALTERS THE DESIGN ALTERS THE DESIGN ALTERS THE DESIGN ALTERS THE DESIGN ALTERS THE DESIGN ALTERS THE DESIGN ALTERS THE DESIGN ALTERS THE DESIGN ALTERS THE DESIGN ALTERS THE DESIGN ALTERS THE DESIGN ALTERS THE DESIGN ALTERS THE DESIGN ALTERS THE DESIGN ALTERS THE DESIGN ALTERS THE DESIGN ALTERS THE DESIGN ALTERS THE DESIGN ALTERS THE DESIGN ALTERS THE DESIGN ALTERS THE DESIGN ALTERS THE DESIGN ALTERS THE DESIGN ALTERS THE DESIGN ALTERS THE DESIGN ALTERS THE DESIGN ALTERS THE DESIGN ALTERS THE DESIGN ALTERS THE DESIGN ALTERS THE DESIGN ALTERS THE DESIGN ALTERS THE DESIGN ALTERS THE DESIGN EXPERIENCE ALTERS THE DESIGN EXPERIENCE ALTERS THE DESIGN EXPERIENCE ALTERS THE DESIGN EXPERIENCE ALTERS THE DESIGN EXPERIENCE ALTERS THE DESIGN EXPERIENCE ALTERS THE DESIGN EXPERIENCE ALTERS THE DESIGN EXPERIENCE ALTERS THE DESIGN EXPERIENCE ALTERS THE DESIGN EXPERIENCE ALTERS THE DESIGN EXPERIENCE ALTERS THE DESIGN EXPERIENCE ALTERS THE DESIGN EXPERIENCE ALTERS THE DESIGN EXPERIENCE ALTERS THE DESIGN EXPERIENCE ALTERS THE DESIGN EXPERIENCE ALTERS THE DESIGN EXPERIENCE ALTERS THE DESIGN EXPERIENCE ALTERS THE DESIGN EXPERIENCE ALTERS THE DESIGN EXPERIENCE ALTERS THE DESIGN EXPERIENCE ALTERS THE DESIGN EXPERIENCE ALTERS THE DESIGN EXPERIENCE ALTERS THE DESIGN EXPERIENCE ALTERS THE DESIGN EXPERIENCE ALTERS THE DESIGN EXPERIENCE ALTERS THE DESIGN EXPERIENCE ALTERS THE DESIGN EXPERIENCE ALTERS THE DESIGN EXPERIENCE ALTERS THE DESIGN EXPERIENCE ALTERS THE DESIGN EXPERIENCE ALTERS THE DESIGN EXPERIENCE ALTERS THE DESIGN EXPERIENCE ALTERS THE DESIGN EXPERIENCE ALTERS THE DESIGN EXPERIENCE ALTERS THE DESIGN EXPERIENCE ALTERS THE DESIGN EXPERIENCE ALTERS THE DESIGN EXPERIENCE ALTERS THE DESIGN EXPERIENCE ALTERS THE DESIGN EXPERIENCE ALTERS THE DESIGN EXPERIENCE ALTERS THE DESIGN EXPERIENCE ALTERS THE DESIGN EXPERIENCE ALTERS THE DESIGN EXPERIENCE ALTERS THE DESIGN EXPERIENCE ALTERS THE DESIGN EXPERIENCE ALTERS THE DESIGN EXPERIENCE ALTERS THE DESIGN EXPERIENCE ALTERS THE DESIGN EXPERIENCE ALTERS THE DESIGN EXPERIENCE ALTERS THE DESIGN EXPERIENCE ALTERS THE DESIGN EXPERIENCE ALTERS THE DESIGN EXPERIENCE ALTERS THE DESIGN EXPERIENCE ALTERS THE DESIGN EXPERIENCE ALTERS THE DESIGN EXPERIENCE ALTERS THE DESIGN EXPERIENCE ALTERS THE DESIGN EXPERIENCE ALTERS THE DESIGN EXPERIENCE ALTERS THE DESIGN EXPERIENCE ALTERS THE DESIGN EXPERIENCE ALTERS THE DESIGN EXPERIENCE ALTERS THE DESIGN EXPERIENCE ALTERS THE DESIGN EXPERIENCE ALTERS THE DESIGN EXPERIENCE ALTERS THE DESIGN EXPERIENCE ALTERS THE DESIGN EXPERIENCE ALTERS THE DESIGN EXPERIENCE ALTERS THE DESIGN EXPERIENCE ALTERS THE DESIGN EXPERIENCE ALTERS THE DESIGN EXPERIENCE ALTERS THE DESIGN EXPERIENCE ALTERS THE DESIGN EXPERIENCE ALTERS THE DESIGN EXPERIENCE ALTERS THE DESIGN EXPERIENCE ALTERS THE DESIGN EXPERIENCE ALTERS THE DESIGN EXPERIENCE ALTERS THE DESIGN EXPERIENCE ALTERS THE DESIGN EXPERIENCE ALTERS THE DESIGN EXPERIENCE ALTERS THE DESIGN EXPERIENCE ALTERS THE DESIGN EXPERIENCE ALTERS THE DESIGN EXPERIENCE ALTERS THE DESIGN EXPERIENCE ALTERS THE DESIGN EXPERIENCE ALTERS THE DESIGN EXPERIENCE ALTERS THE DESIGN EXPERIENCE ALTERS THE DESIGN EXPERIENCE ALTERS THE DESIGN EXPERIENCE ALTERS THE DESIGN EXPERIENCE ALTERS THE DESIGN EXPERIENCE ALTERS THE DESIGN EXPERIENCE ALTERS THE DESIGN EXPERIENCE ALTERS THE DESIGN EXPERIENCE ALTERS THE DESIGN EXPERIENCE ALTERS THE DESIGN EXPERIENCE ALTERS THE DESIGN EXPERIENCE ALTERS THE DESIGN EXPERIENCE ALTERS THE DESIGN EXPERIENCE ALTERS THE DESIGN EXPERIENCE ALTERS THE DESIGN EXPERIENCE ALTERS THE DESIGN EXPERIENCE ALTERS THE DESIGN EXPERIENCE ALTERS THE DESIGN EXPERIENCE ALTERS THE DESIGN EXPERIENCE ALTERS THE DESIGN EXPERIENCE ALTERS THE DESIGN EXPERIENCE ALTERS THE DESIGN EXPERIENCE ALTERS THE DESIGN EXPERIENCE ALTERS THE DESIGN EXPERIENCE ALTERS THE DESIGN EXPERIENCE ALTERS THE DESIGN EXPERIENCE ALTERS THE DESIGN EXPERIENCE ALTERS THE DESIGN EXPERIENCE ALTERS THE DESIGN EXPERIENCE ALTERS THE DESIGN EXPERIENCE ALTERS THE DESIGN EXPERIENCE ALTERS THE DESIGN EXPERIENCE ALTERS THE DESIGN EXPERIENCE ALTERS THE DESIGN EXPERIENCE ALTERS THE DESIGN EXPERIENCE ALTERS THE DESIGN EXPERIENCE ALTERS THE DESIGN EXPERIENCE ALTERS THE DESIGN EXPERIENCE ALTERS THE DESIGN EXPERIENCE ALTERS THE DESIGN EXPERIENCE ALTERS THE DESIGN EXPERIENCE ALTERS THE DESIGN EXPERIENCE ALTERS THE DESIGN EXPERIENCE ALTERS THE DESIGN EXPERIENCE ALTERS THE DESIGN EXPERIENCE ALTERS THE DESIGN EXPERIENCE ALTERS THE DESIGN EXPERIENCE ALTERS THE DESIGN EXPERIENCE ALTERS THE DESIGN EXPERIENCE ALTERS THE DESIGN EXPERIENCE ALTERS THE DESIGN EXPERIENCE ALTERS THE DESIGN EXPERIENCE ALTERS THE DESIGN EXPERIENCE ALTERS THE DESIGN EXPERIENCE ALTERS THE DESIGN EXPERIENCE ALTERS THE DESIGN EXPERIENCE ALTERS THE DESIGN EXPERIENCE ALTERS THE DESIGN EXPERIENCE ALTERS THE DESIGN EXPERIENCE ALTERS THE DESIGN EXPERIENCE ALTERS THE DESIGN EXPERIENCE ALTERS THE DESIGN EXPERIENCE ALTERS THE DESIGN EXPERIENCE ALTERS THE DESIGN EXPERIENCE ALTERS THE DESIGN EXPERIENCE ALTERS THE DESIGN EXPERIENCE ALTERS THE DESIGN EXPERIENCE ALTERS THE DESIGN EXPERIENCE ALTERS THE DESIGN EXPERIENCE ADDING TO DESIGN REALITY —VIRTUALLY ADDING TO DESIGN REALITY —VIRTUALLY ADDING TO DESIGN REALITY —VIRTUALLY ADDING TO DESIGN REALITY —VIRTUALLY ADDING TO DESIGN REALITY —VIRTUALLY ADDING TO DESIGN REALITY —VIRTUALLY ADDING TO DESIGN REALITY —VIRTUALLY ADDING TO DESIGN REALITY —VIRTUALLY ADDING TO DESIGN REALITY —VIRTUALLY ADDING TO DESIGN REALITY —VIRTUALLY ADDING TO DESIGN REALITY —VIRTUALLY ADDING TO DESIGN REALITY —VIRTUALLY ADDING TO DESIGN REALITY —VIRTUALLY ADDING TO DESIGN REALITY —VIRTUALLY ADDING TO DESIGN REALITY —VIRTUALLY ADDING TO DESIGN REALITY —VIRTUALLY ADDING TO DESIGN REALITY —VIRTUALLY ADDING TO DESIGN REALITY —VIRTUALLY ADDING TO DESIGN REALITY —VIRTUALLY ADDING TO DESIGN REALITY —VIRTUALLY ADDING TO DESIGN REALITY —VIRTUALLY ADDING TO DESIGN REALITY —VIRTUALLY While 3-D modeling offers a real-life view of the design project, there is another level of the 3-D experience that can allow the viewer to walk inside the model: virtual reality. Virtual reality cannot happen with a BIM program; an app can convert BIM into virtual reality to enhance BIM. Like gamers, the viewer wears a headset or goggles to enter the model virtually. 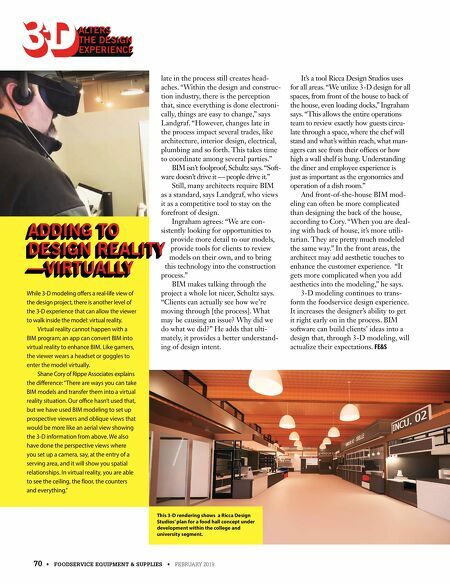 Shane Cory of Rippe Associates explains the difference: "There are ways you can take BIM models and transfer them into a virtual reality situation. Our office hasn't used that, but we have used BIM modeling to set up prospective viewers and oblique views that would be more like an aerial view showing the 3-D information from above. We also have done the perspective views where you set up a camera, say, at the entry of a serving area, and it will show you spatial relationships. In virtual reality, you are able to see the ceiling, the floor, the counters and everything." This 3-D rendering shows a Ricca Design Studios' plan for a food hall concept under development within the college and university segment.